Missouri’s state musical instrument: fiddle and the state folk dance is the square dance. Maple Leaf Rag became one of the first pieces of American sheet music to sell over one million copies. Missouri has 5,500 recorded caves. Nearly 20 Missouri caves are called or connected to saltpeter, which was mined in some Missouri caves in the early 1800’s because nitrate was needed for the manufacture of gunpowder. At least 13 cave names are associated with “beaver,” 36 with “bear,” 13 with “panther,” and 17 with “wildcat.” More than 30 have “buzzard” in their names. Many historians believe that the Civil War began along the border of Missouri and Kansas when Missourians and Kansans battled over whether Kansas would become a “free-state” or a “slave state.” The border warfare began in 1854, seven years before the start of the Civil War. Blanche Kelso Bruce, the slave child of a Mississippi planter and a slave, became the first African-American to serve a full term in the U.S. Senate in 1875. He founded a school for blacks in Hannibal. Creve Coeur’s name means broken heart in French, comes from nearby Creve Coeur Lake. Legend has it that an Indian princess fell in love with a French fur trapper, but the love was not returned. According to the story, she then leaped from a ledge overlooking Creve Coeur Lake; the lake then formed itself into a broken heart. In Missouri, minors are not allowed to purchase cap pistols, however, they may buy shotguns freely. The most destructive tornado on record occurred in Annapolis, Missouri on March 18, 1925. In three hours, it spun through the town leaving a 980-foot wide trail of demolished buildings, uprooted trees, overturned cars and left in its wake 823 people dead and almost 3,000 injured. Iced Tea was first served at the St. Louis World’s Fair in 1904. The state animal is the Mule. A milkman may not run while on duty in Missouri. The “Missouri Waltz” became the state song under an act adopted by the General Assembly on June 30, 1949. The present Missouri Capitol in Jefferson City was completed in 1917 and was the sixth in Missouri history. The first seat of state government was housed in the Mansion House in St. Louis, the second was in the Missouri Hotel in St. Louis, St. Charles was designated as the temporary capital of the state in 1821 and remained the seat of government until 1826 when Jefferson City became the permanent capital city. The current building was the third in Jefferson City as the first burned in 1837, the second burned in 1911. Kansas City has more miles of freeway per capita than any metro area with more than 1 million residents. Frightening a baby is in violation of the law in Missouri. Jefferson National Expansion Memorial consists of the Gateway Arch, the Museum of Westward Expansion, and St. Louis’ Old Courthouse. During a nationwide competition in 1947-48, architect Eero Saarinen’s inspired design for a 630-foot stainless steel arch was chosen as a perfect monument to the spirit of the western pioneers. Construction of the Arch began in 1963 and was completed on October 28, 1965. In February 2018, President Donald Trump signed legislation renaming the Memorial “Gateway Arch National Park”. The tallest man in documented medical history was Robert Pershing Wadlow from St. Louis. He was 8 feet, 11.1 inches tall. Situated within a day’s drive of 50% of the U.S. population, Branson and the Tri-Lakes area serves up to 65,000 visitors daily. Should you decide to provide alcoholic beverages to an elephant in Missouri, you could be arrested. 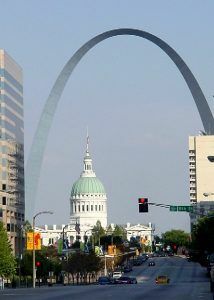 The tallest monument built in the U.S., the Gateway Arch, in St. Louis, is 630 feet tall. Missouri’s oldest community, Saint Genevieve, was founded as early as 1735. Saint Louis University received a formal charter from the state of Missouri in 1832, making it the oldest University west of the Mississippi River. Dancing is strictly prohibited in Missouri. Hermann, Missouri is a storybook German village with a rich wine-making and riverboat history that is proudly displayed in area museums. Built in 1836 as the “New Fatherland” for German settlers, the town has achieved national recognition because of its quality wines and distinctive heritage. Auguste Chouteau founded Saint Louis in 1764. On Sucker Day in Nixa, Missouri, school closes officially and the little town swells to a throng of 15,000 hungry folks. All craving a taste of the much maligned but delicious bottom dweller fish loathed by almost everyone else. During the Civil War, Missouri was the scene of more than 1,000 battles.